Portuguese Fish Chowder is a fish chowder that combines the New England style of fish chowders along with Portuguese style cooking and ingredients. The addition of tomatoes in place of milk or cream unlike other chowders is historically the work of Portuguese immigrants in Rhode Island and the South Coast of southeastern Massachusetts, as tomato-based stews were already a traditional part of Portuguese cuisine. 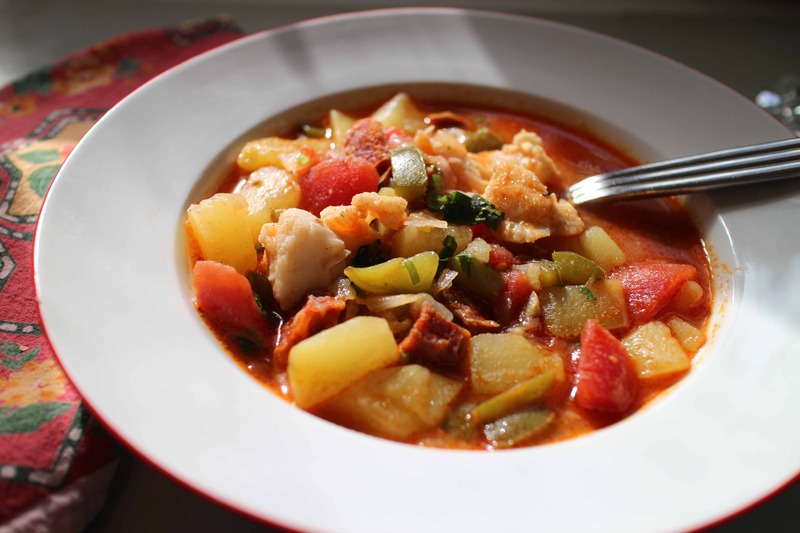 This Portuguese fish chowder uses the delicious spicy flavors of Portuguese chouriço with some great seafood flavors to make a delicious hearty soup. It is a classic Portuguese-American dish that is sure to impress, with an unbelievable scent and loads of flavor. 1) Heat a saucepan over medium heat and add the olive oil, bay leaf, and chopped garlic cloves. 2) Add the onions, diced bell pepper, and paprika and saute until the onions are browned slightly while stirring. 3) Add the stock and potatoes and turn up the heat. Bring to a boil and cover. Let it cook for 10 minutes while stirring. 4) Reduce the heat to medium, add the tomatoes and sliced chourico, and let it simmer for 5 minutes. Season with salt and pepper to taste. 5) Add the whole fillets of fish and cook on medium heat for 5 minutes. 6) Add the chopped cilantro while stirring slowly. Let it sit for 10 minutes. 7) Sprinkle with the chopped parsley and let it cool for another 15-20 minutes. 8) Serve with some bread to dip.